An angel is setting San Francisco afire. To destroy the fallen angels hiding on Earth, it will stop at nothing, no matter how many innocents have to die. Now two police detectives have discovered the terrifying truth behind this epidemic of unexplained fires. But how do you stop an angel? 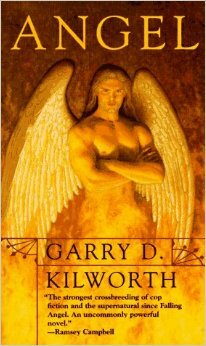 I can’t resist a book with the image of an angel and title of Angel on the cover. That this is a thriller makes it doubly interesting to me. Cops are after a killer angel. How cool is that? As a Catholic, I have been brought up to revere saints and angels. Since as a child, I have been fascinated. When urban fantasy and paranormal romance books came out featuring angels hero and nemesis, I was thrilled. Given this, I do not have the usual apprehension over reading books with story lines drawn from Christian mythology and literature. This is fiction after all and writers get their inspiration from everywhere. As long as the writing is not preachy, I’m fine with it. In this book Cops meets Supernatural. Its premise is that there are fallen angels everywhere. They fall when they let malice enter their souls and take over their actions. Even if angels are avenging and ruthless, if they commit violence for God (or if they think it is for God), they are still pure and will not be considered evil. On the earthly plane, they retain most of their divine power and are physically asexual. Angels who fall are physically beautiful, stronger than most humans, and can only be killed by fire. Lately, there are fires breaking out killing hundreds all over the world, including San Francisco. Two city cops are assigned to bring down the arsonist responsible. In their investigation they become embroiled in one angel’s vendetta against the fallen. But how can they catch an angel of justice? This was a quick read as I was hooked by the mystery, which was was not about who was committing the crimes but about how can the perpetrator be brought to justice. And for about three-fourths of the book, the characters and I were dumbfounded. Unless there will be divine intervention, there seemed no way to do it. I liked that the characters were regular people, flawed, prone to sinning and not very likable to be honest. But they were the ones standing against a holocaust. So even as I rooted for them I was disapproving some of their actions as if they were real people. One of the cops was grieving. I didn’t think it appropriate nor realistic for him to just take up with a woman hardly a month after a loved one’s death. But I figured the author needed the other woman in the picture so that’s why. But that relationship felt forced. Some books trigger questions. Angel did and my question was what makes a person evil? The fallen or demons are supposedly evil yet they do little harm because they prefer to keep their nose clean while the angel of God is extremely destructive. The angel of justice was merciless with no empathy and yet for the longest time it was considered a warrior of God. Is evil the lack of conscience and empathy? In the book the angel of justice is like a terrorist, convinced it is good despite the carnage it causes. To the angel, anything is justified if it is committed in the name of God. I guess terrorists can’t tell they are delusional or, if they can, they prefer to continue pretending because they enjoy the results of their self-serving actions. At least in this book, justice was served.